ROAD TOWN, Tortola, VI - It was erected some three years ago on December 17, 2014, but it can be assumed that no one at the time noticed the error until our newsroom started to do fun pieces on the many grammatical mistakes and typos on public documents over the past six years. While the Ministry of Education and Culture, beginning with the Minister Hon Myron W. Walwyn (AL), takes the cake for bad grammar in public letters, press releases, statements and Facebook posts coming out of that Ministry and some of the Departments and Units that are part of the Ministry of Education and Culture, the new buzz is the signage at the state-owned Peebles Hospital in Road Town. There is a typo in the word 'healthcare' which was misspelt on the signage and written as "healtcare", with the 'h' missing. 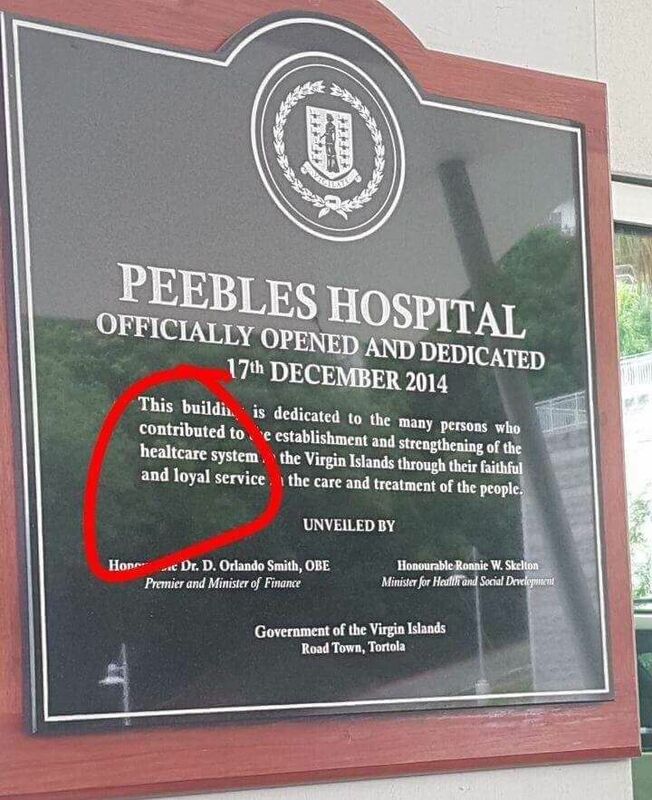 We know that this is not a reflection of the improved healthcare services provided by the new Hospital. However, on such an auspicious occasion as the grand opening in 2014 of the much needed new hospital facility and after two administrations and two loans and 12 years to complete, someone could have proofread the signage. While the BVI Health Services Authority has been tight-lipped about whether or not a correction will be made, the signage as of publication time today, July 8, 2017, is still displayed on the entrance wall of the building. Now, do not get our newsroom wrong; we all make mistakes and Virgin Islands News Online will admit that with some 50 stories a week, we have had our fair share of typos and errors. But we expect public officers with so much talent, resources and education, will at least take the time to proof read, especially on a history making occasion as the opening of the new hospital that will provide the best HEALTHCARE for our residents and visitors. But then again, with Mandarin and French on their way, speaking, writing and reading good standard English might become a thing of the past. Really, so long I saw that and I never care to complain...i wasnt there for reading proposes to give a glass door attention. In the end no one is prefect. So nothing going to kill the person to fix it. It can't be fixed due to space issue. Just another wasted replacement cost. Now it is clear to me that no one cares about doing things right and correct. What happen to national pride? VINO, between the cartoons and these fun articles, y'all gone kill me with jokes. Thanks for the laugh! LOL! Well the ad for Miss BVI says 'Miss Brtish Virgin Islands'. So what we expect. I bet we can spell Jamaica though. We mixing-up English with Mandarin and French already, and we haven't even started. Lord help us. This says A LOT about the BVIHSA and the government in general. You trying to tell me that NO ONE proof read this thing? C'mon! "Now, do not get our newsroom wrong; we all make mistakes and Virgin Islands News Online will admit that with some 50 stories a week, we have had our fair share of typos and errors." Everything is done hastily with this gang. Rush rush rush snap snap snap. I bet they can't do another snap election. People just disgusted right about now! You mean elecktion right. Lol you got to spell like them to get rid of them. Vino it tek ah yo 2 n a half year to sea da strupes, pardon my ingles bwaaahahaha. Even the most diligent grammarian will make grammar and spelling errors. Nonetheless, it is complete staff work to proof read letters, memos, signage, reports, speeches, presentations.........etc for misspellings, grammar, accuracy, clarity, style, format....etc. Suggest getting peer review of draft documents and let draw documents sit for a whole and them reread. This is showcases the results of a poor education system in BVI. Poor with their own English language and they love to talk about us Jamaicans. The mirror is there "FI UNU!" @Jamaican, yes, we should pay attention to detail in speaking and writing English. The spoken word is equivalent to ringing a bell; once rung, it cannot be unrung. Residents need to apply the carpenters' rule, ie, measure twice or thrice and cut one. Proof read, proof read and proof read! English is VI own language, you say. Pray tell what language do Jamaica speak? Potwah? Does Jamaica speak English? @jamaican: let immigration ask you to leave the BVI tomorrow and see the eye water: can you say money gram !!!!! @Jamaican, look at your writing, for you are in no position to provide negative feedback to Virgin Islanders on their poor writing. Others may be in a position to but not you. Every place better than the BVI yet many fight, forge documents, falsify documents..........etc to get to the BVI. Too many ah yu piss on the BVI until when you have to leave you crying bucket of tears. Jamaican, you should delete is in front of showcases or replace showcases with showcasing; as in 'This showcases' or 'This is showcasing'. What you have written is not grammartically correct. But Virgin Islanders usually write as they speak and are not aware that there is a mistake. @Gramma Poliice, clearly you may have inadvertently left the R off grammar. Or it was done deliberately to make a point. True, Virgin Islanders may write as they speak but though dialect is acceptable, one has to know the difference between it and standard English. Command of both allow one to communicate effectively from Premier down to those at lower end of the economic ladder. Speak dialect but be able to transition from it to standard English. Civil society needs to file charges with the International Criminal Court of Justice (ICCJ) in the Hague against all these BVI politicians. My head HURTS!... Is this for REAL? and We wonder what has sparked the current "don't care attitude" and "any thing goes" wave now engulfing the BVI? these little mistakes are absolutely beyond belief. Does Vino knows who the bloggers are? That's more of a concern to me. If they keep a name data on us...We need to know... Spelling healthcare wrong is Very minor in comparison to health mistakes. We way better off focussing on health care mistakes and trying to eliminate them. Than some missing H..Bull..a no story...As usual. Don't print..
them or how they acquire them, all we know is that it's a degree and we feel good to hire them. When put to the real test they can perform, they don’t even have enough common sense to use spell check , so am not surprised at all with these typos. is this really news..a word spelt wrong. Guess who got the business to do the sign? It was actually done overseas. Anything else? People need to get a life. If your kids notice it, tell them the correct spelling and do not sweat about it. Some just need to work with their HANDS and leave the spelling to grown ups.